Etc. : Became the dominant TV news operation in Central Florida after knocking off Channels 2 and 6, claiming the top-rated newscast in 1978. … Has had the No. 1 early evening newscast ever since — an impressive streak of more than 30 years. … Ratings for its early-evening news are often higher than those of its competitors combined. … First local color TV newscast … Years later, in early 1980s, started the second 5:30 news in the market. … Also started the first 5 p.m. news in market, “Live at 5.” … Added the second station-owned Doppler radar in market, originaly called the “Live Early Warning Doppler 9000 Radar Network” (say that three times fast). … Airs 3-1/2 hours of local news on Saturday mornings and 2-1/2 hours on Sunday mornings. … Former anchors/reporters include Natalie Allen (CNN), Deborah Roberts (wife of Today weatherman Al Roker and formerly of 20/20), Wyatt Andrews (CBS), John Tesh (Entertainment Tonight). … Produces morning 7-9 a.m. and 10-11 p.m. newscasts for sister station WRDQ-Channel 27. Station History: Went on the air in February 1958 as WLOF-TV — the third station in Central Florida behind WDBO-Channel 6 and WESH-Channel 2 … Started regularly-scheduled newscasts, Central Florida News, in September 1959 with Jonathan Dunn-Rankin – who would film and edit the news report. … Call letters WLOF (We Love Orlando Florida) were shared with a popular radio station in town. Call letter were changed in 1963 to WFTV (Wonderful Florida Television.) 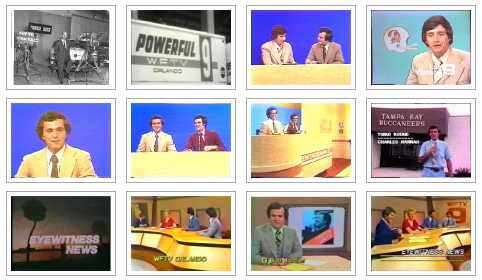 … WFTV was the first station with a mobile unit and also the first to broadcast local shows in color … Long an also-ran among the Central Florida TV stations, WFTV’s fortunes turned in the late 1970s thanks in part to ABC’s strong ratings as well as a new transmission tower that boosted the station’s signal … Bob Jordan, who came to WFTV as news director/anchor in the late 1970s, led Eyewitness News’ march to No. 1. Among his innovations was hiring the first female anchor in the market, Carole Nelson, to anchor the noon and co-anchor 6 p.m. news. Also oversaw the move to electronic news gathering equipment from film. … Jordan would leave WFTV, return again as anchor and news director in the 1980s, leave again and then return in the late 1990s to boost the station’s sagging news ratings back to their high levels. … Formed Orlando’s second duopoly when Cox acquired WRDQ-Channel 27. … On June 29, 2006, became the first station in Florida and the 10th in the nation to start broadcasting its local news in high definition. 2000 – Eyewitness News at 6 p.m.
1997 – Eyewitness News at 11 p.m.
Would You Like To Put Up The 1987 Video Open Of WFTV-TV’s Channel 9 Eyewitness News At 6 For Me, Please? Can You Put Up The Nov. 1985 Video Open Of WFTV-TV’s Channel 9 Eyewitness News At 6, Please? Can You Put Up The Jul. 1983 Video Open Of WFTV-TV’s Channel 9 Eyewitness News Tonight For Me, Please? This is for your sports department. I would like to invite your team to attend the Florida Dart Association’s annual State Team Competition. This year is our 27th year compteting and 24 teams from the state will be vying to win the coveted title of best of Florida. The Central Florida Dart Association (CFDA) has won the last two years and is in strong contention to win a third title this year. This event is being held at the Ramada Celebration Resort October 8th thru the 10th. I would love an email address I can send more information to. greetings wftv news , I’ve been watching your news for about 21 years. lately I have found myself turning to other channels news programs because of wftv’s constant coverage of casey anthony. whenever the news comes on now I find myself jumping up for the remote to change the channel to avoid seeing her in the news again. my friends and I cannot understand why wftv devote so much time to her new found fame. I am over the continued all day media coverage of the Casey Anthony trial. Updates are fine but all day is a LOT too much. Saving money on electric as my TV is off all day until this is over. How Would You Like To Post A Video Clip Of WFTV-TV’s Together On Channel 9 Video Promo From Late 1986, Please?